LG the South Korean Electronics and Chemicals Giant got into the crystalline silicon solar panel manufacturing business along with a number of other Korean Conglomerates like Hyundai and Samsung. With the government policy of strongly supporting Green Industry through various initiatives to make Korea a Green Superpower, most Korean Industrial Groups have enthusiastically entered most Renewable Energy Sectors with the Korean Shipping Companies like Daewoo entering the Wind Turbine Manufacturing Industry. The world is experiencing a solar revolution recently. It is expected that solar will generate 16% of global electricity by 2050, from less than 1% now. According to SEIA solar power will hit 95GW mark by 2022, enough to power 19 million homes. This will tantamount to offsetting emissions from 26 coal power plants, almost equal to 100 million metric tons of CO2 annually. Major countries have thus pledged to increase their solar installations and have set aggressive targets to achieve the same. For example, India is expecting to install 100 GW of solar by 2022, USA has extended its investment tax credit for the benefit of solar installers, China continues to be a major market for solar with the country installing ~16GW in 2015 itself. LG Electronics is a renowned company specializing in electronics equipment and solar. This boom in the solar market will be a good point of time for the company to leverage from. Since the company believes in manufacturing and selling high quality solar products, it has bigger markets in more developed countries like USA, Europe and Japan. However its products are also common in China and India. The LG Group is producing solar products through two Group Companies. LG Solar Energy was formed in 2007 to produce polysilicon which is the most important raw material for the production of solar wafers. 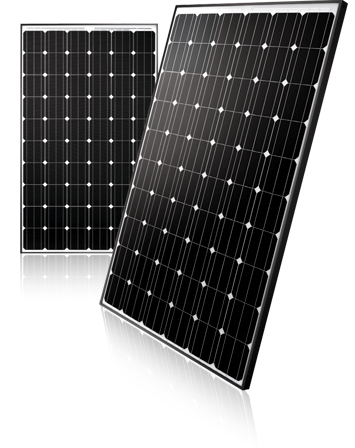 It is already selling solar modules in the South Korean and European markets. LG Electronics plans to invest $438 million in its Gumi plant and add six more production lines by 2018, raising it to 14 from 8 currently. LG production capacity is expected to increase its production capacity to 1.8GW by 2018 and 3GW by 2020 from 1GW currently. LG Electronics increased the production output of its facilities in Gumi, South Korea. The factory now uses two additional production lines to create solar cells with CELLO technology. The compny estimates to reduce greenhouse gases in product usage by 150,000 tons by 2020. Read more about the Solar Energy Manufacturing by South Korean Companies and Buying Wholesale Solar Panels. i) LG Mono X plus modules come in 60 cells with wattage 275W, 280W and 285W, with efficiency level ranging between 16.8%, 17.1% and 17.4% respectively. These modules are sturdy enough to withstand pressure load of 100 lb against wind and snow. ii) LG Neon 2 modules also come in 60 and 72 cells. The 60 celled modules come in 305W, 310W, 315W and 320W. The efficiency levels range between 18.6% and 19.5%. There are four modules available under this category. The 72 celled modules come in a 6×12 setting – 360W and 365W with efficiency of 18.4% and 18.6% respectively. iii) LG Neon 2 Black module comes in a 6×10 setting with 300W and efficiency of 18.3%. iv) LG Neon 72 celled are 6×12 modules. Two models are available here in 360W and 365 W, with efficiency of 18.4% and 18.6% respectively. LG offers industry leading 10-year product warranty and a linear performance warranty that guarantees a minimum power output of 80.2% after 25 years. 1) Solar Panels Efficiency – Some Solar Panels are more efficient.For example Solar Panels made by Sunpower and Sanyo are the most efficient which means they require less area.For space constrained homes,they are the best bet but they cost more per watt hour of electricity generated.Click on the heading of this paragraph to understand more about Efficiency. Has anyone purchased this MonoX LG275S1C-B3? If so, what has your experience been with this products? Is there any flaws? How efficient is it? How much have you saved?